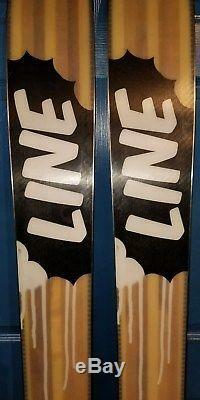 A used demo pair of Line The 130 big mountain and powder skis with Marker Jester 16 (din range 6-16). Bindings are Marker Jester 16 mounted for a 27.5 mondopoint boot size. Line and The 130 can take credit for leading the charge in innovative off piste performance. Retaining the super fat 130mm waist and Early Taper/Early Rise tip (25cm x 15mm) that made The 130 an innovator it is ready for big mountain dominance. A 4D Fibercap construction helps to keep the weight down, a must given how wide this guy really is. The signature Maple Macroblock core lends The 130 all the power needed to charge and stomp in the deepest of deep. By only using Early Rise in the tip with P-Cut geometry The 130 keeps plenty of camber and sidecut to compliment the effortless float with a reasonable degree edge hold and ease of turning on hard packed. While Line offers a few choices for off piste riding nothing has the heritage of The 130 or the dominance at speed. There really is no better friends on a powder day. Early Rise Tip 25cm x 15mm. Extruded Fatty Base and Fatty Edges. The item "LINE SKIS THE 130 186CM SKIS With MARKER JESTER 16 BINDINGS" is in sale since Saturday, August 25, 2018. This item is in the category "Sporting Goods\Winter Sports\Downhill Skiing\Skis". The seller is "sir_davahad" and is located in Seattle, Washington. This item can be shipped to United States, Canada, United Kingdom, Denmark, Romania, Slovakia, Bulgaria, Czech republic, Finland, Hungary, Latvia, Lithuania, Malta, Estonia, Australia, Greece, Portugal, Cyprus, Slovenia, Japan, China, Sweden, South Korea, Indonesia, Taiwan, Belgium, France, Hong Kong, Ireland, Netherlands, Poland, Spain, Italy, Germany, Austria, Israel, New Zealand, Philippines, Singapore, Switzerland, Norway, Saudi arabia, Ukraine, United arab emirates, Qatar, Kuwait, Bahrain, Croatia.